There have been several attempts to measure influence on Twitter, most notably the much-maligned Klout. Now comes Social Authority, a new metric launched by SEOmoz, through its recent acquisition, Followerwonk. Despite its awkward name, Followerwonk is a useful tool, slicing and dicing data from the Twitter API. I have used it, for example, to find the time of day when my Twitter followers are most active (4pm – 5pm), and that 57% of them are likely to be female. Social Authority (which might be better named Twitter Authority) is essentially determined by the number of times your posts are reTweeted. 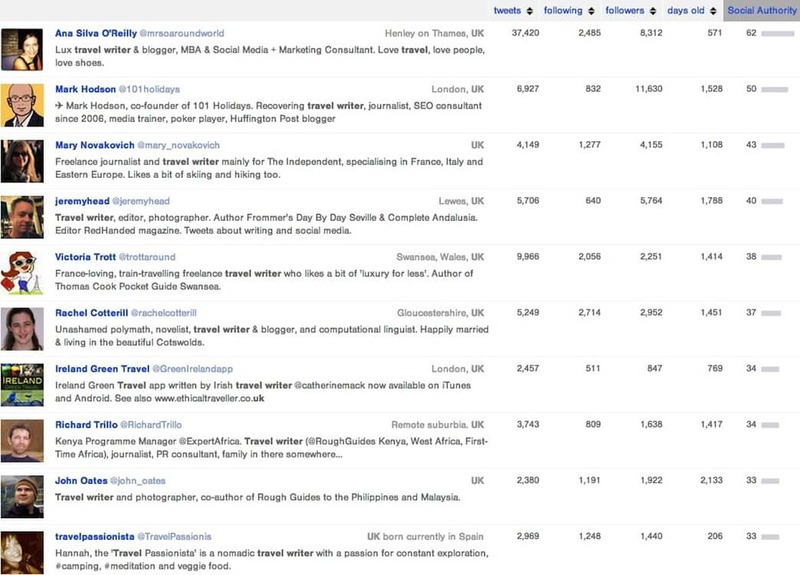 So I thought it would be interesting to see – according to this metric – who are the most influential UK travel writers. The key caveat here is that Followerwonk crawls Twitter bios, so if you don’t use the exact phrase “travel writer” in you bio, then you won’t be returned in results. It’s clearly a good idea to “optimise” your bio. Is this a good way of measuring social authority? Let me know what you think in the comments. You can download the Top 100 results here (PDF).